I was private messaged with a request to explain/re-post this after the photobucket mess left the sticky at the top of the forum ("Helpful headlight switch info") useless with missing pictures. So, for the interim, here's a quick how-to. Pre-1968 vehicles have an independent wire or wires that feeds the front parking lamp filaments. They are turned on when the headlight switch is pulled out to the first position. When you pull out the switch to the second position (to turn on the headlights), the parking lights turn off. 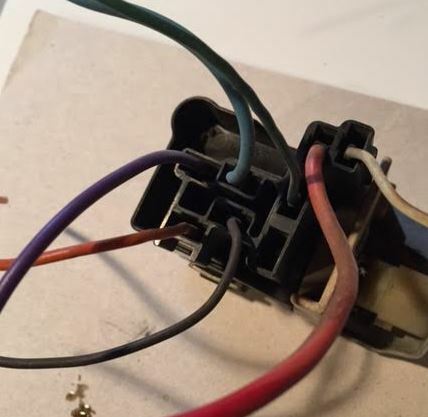 To change this so your vehicle acts like 1968-current vehicles (where the front parking lights stay on with the headlights, you must remove and relocate the purple wire at the headlamp switch. Start by removing the (-) battery cable. Gain access to the headlamp switch. You'll see the purple wire feed is the furthest to the left in the picture. 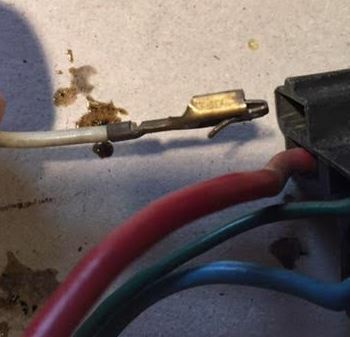 Unplug the connector assembly from the headlamp switch. 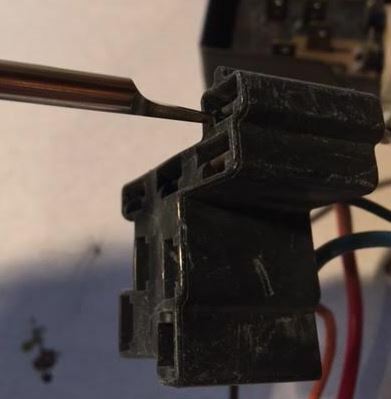 Use a very small screwdriver or Packard terminal extraction tool and insert it into the side opposite of where the wire comes out. Notice you are inserting into the smaller cut-out area just below the main cavity that holds the terminal. You press in to bend back the "finger" catch. You then pull on the wire gently to remove. After the wire has pulled out. bend the "finger" back down as shown so it will "catch" again in the new connector cavity. Now insert the purple wire in the new cavity location as shown. If the catch is working, you will hear a slight "click" and the connector will be locked into place. The purple wire is now relocated from the far left to the bottom right as shown in this particular picture. By moving the wire, you are effectively linking the front parking lamp filaments to the tail lamp feed...so....when you turn on the headlights now, your parking lamps will stay lit! Plug the connector back into the switch. Reassemble as needed and reconnect the battery. Test your modification. Jeff65SS, 71350SS, 427L88 and 4 others like this. Thanks Joe. just what we needed. Photosuckit sux. may all of their corporate leadership roast in hell forever. 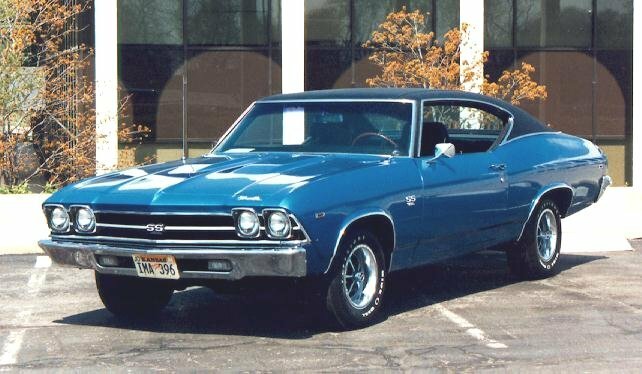 427L88, davewho1 and Kirk's67SS like this. Good info! I would have assumed that you need to replace the switch with a newer year. Thanks for the great pics. Yes please pics! I have to do some dash redoing and this mod was on the list while I was in there. To Bill's question, new switch warranted? THNX. FYI. 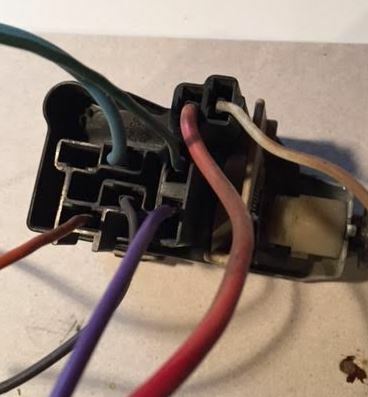 This is a 1965 Malibu SS harness and headlamp switch. When this site went to being a secure site (https instead of http) any photo link that is NOT on a secure site will no longer appear. You can post it as a link, but not an imbedded photo. The best option is to load the photos as attachments. I'll edit Joe's original post to at least provide links to his photos.